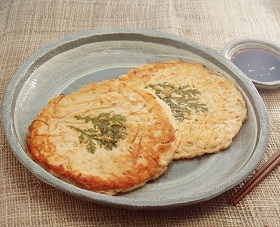 Bindaetteok literally means "mung bean pancake" in Korean and it is a variety of jeon, a Korean style pancake, similar to pajeon. It is made of ground mung beans, with green onions, kimchi, or peppers cooked in a frying pan. It was originally prepared by frying a mixture of water-soaked and ground mung beans, pork, bracken fern, mung bean sprouts, and cabbage kimchi. Meat, usually pork or beef, can also be added as an ingredient. In Korean restaurants, this dish is served with a small side serving of dipping sauce made of soy sauce, minced green onions, gochugaru (red chili pepper flakes) and some vinegar.